The Woolshed at Ruapuke is situated at the base of Mount Karioi on an 850 acre working dry stock farm. It has commanding views of Ruapuke Beach and out to Gannet Island. The expansive views also incorporate extensive farmland and up to Mount Karioi. The radiant pohutukawa’s attract abundant Tui in the spring, as well as the two resident Wood Pigeons which enhance the peace and beauty of this location. It is the perfect place to enjoy a quiet relaxing holiday, while Raglan is just a 15 minute drive away to enjoy the cafes and boutique shops. Alternatively the Woolshed offers a central location for an adventure packed holiday. Ruapuke beach is a five minute drive to the Southern End or a 10 minute drive to the Northern end if you enjoy surfing or fishing. Horse riding is available within ten minutes or visit the popular Bridal Veil Falls. The Wairake walking track on the southern side of Mount Karioi is just ten minutes walk to the start of the track. Additionally the Pipiwharauroa Walking and Biking Trail on the Wharauroa Plateau is a must for keen cyclists or guests whom have an interest in the Te Uku Wind Farm. The opportunities are endless with paddle boarding, kite surfing, surfing at Whale Bay and Manu Bay, kayaking in the harbour, or a game of golf on the 18 hole country course all available within Raglan. The Woolshed has been converted with a fresh contemporary feel inside. It has double glazing and insulation to provide optimum warmth and comfort. It also offers a fully equipped kitchen and a spacious open plan living area. The bedrooms and bathroom are spacious and the laundry is located down stairs where the Woolshed is still in its original condition. There is plenty of locked storage below for the surboards and fishing rods. The deck offers panoramic views and all day sun. 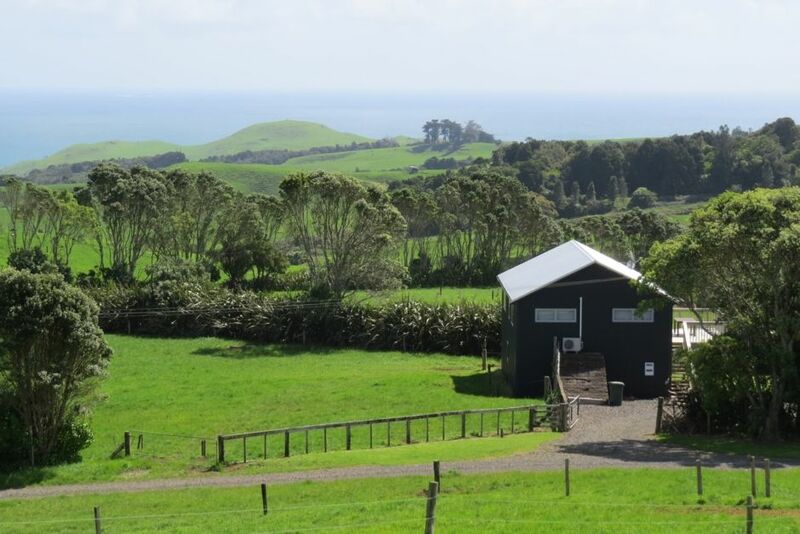 Upon request from the owner you can walk up the farm to take in the magnificent views of the vast coast line, over to Kawhia and Aotea Harbor as well as Mount Egmont. $150 (1-2 Adults), $25 extra per Adult a night, Children (0-15 yrs) $15 extra child per night. Strictly NO parties and No tents/camping allowed. This is a working farm, thus there are normal farm hazards in close proximity to the Woolshed; i.e water troughs, live electric fences, streams, farm tracks, farm machinery, livestock and dogs. Commanding views of Ruapuke Beach and out to Gannet Island. We had a wonderful stay at this country hideaway. The views were amazing! We could see the ocean and the country side. The apartment was an old sheep sheering barn, but you would never know it. We walked into this modern apartment, it was very open, and lots of light coming in the windows. Be sure to shut the blinds if you leave during the day, it helps with the heat. It was warm in the afternoon but cooled off quickly. No A/C or fans. They did have bedding linens, but don't forget to bring your own towels. Wonderful guests to host who were quiet and respectful. The woolshed was left very clean and tidy. Thank you. We hope you enjoy your travels. Note: The woolshed has a heat pump , which is also an air conditioning unit. It heats and cools the whole area. The remote is located on the wall. We are readily available if you have any problems or questions. A great little hideaway. Peace and quiet is what this place is all about. A roomy place with every thing you need for a relaxing getaway . A great location if you enjoy the outdoors would definitely book again should we wish to revisit Raglan. We loved our weekend at Ruapuke Retreat. Its a beautifully renovated cottage with all amenities one could want and an outlook to die for. We will be back for sure. Wonderful guests to host. The woolshed was left immaculate and they were quiet and respectful. Highly recommend to others. Spacious, well furnished property with a lovely sunny deck with views to the coast and Karioi. The wool shed is my favourite getaway. The wool shed is my favourite getaway. Always pristine. A joy to stay at. We absolutely loved our stay at the woolshed! We absolutely loved our stay at the woolshed! The house itself felt very comfortable and homely is very family friendly! The house was absolutely immaculate and very nicely presented. The location of the property was very private and the views were absolutely stunning!! Sea view one side and rolling hills the other. We will definitely be coming back!